This is the Brainwave Deck Original In Bicycle A card is thought of and announced by your spectator. The deck is removed from the box and the cards are spread out face down. 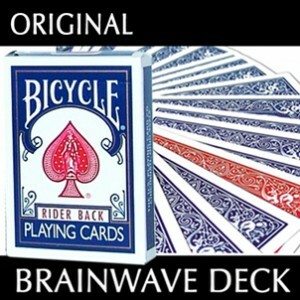 There is only one card face up in the blue back face down deck. It is the spectator's thought of card. And for a second amazing climax, that card is the only one with a red back. Quick to learn and highly effective.